Workers tend a garden in Gomez's 2015 Jardín no 1. 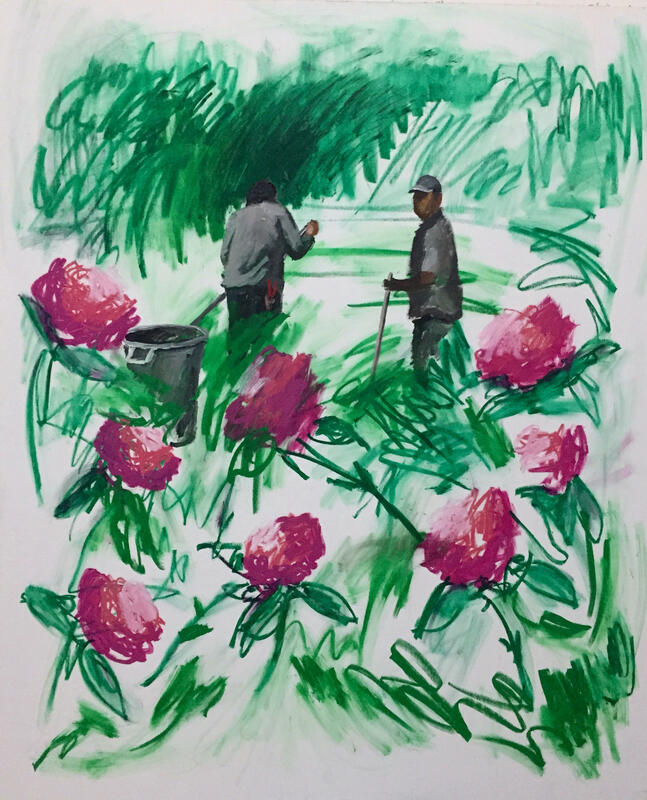 Gardeners stand in for art collectors in Ramiro Gomez's riff on David Hockney's 1968 painting, American Collectors (Fred and Marcia Weisman), which you can see here. Gomez takes ads for luxury products and imagines the individuals who make them possible. Above, his 2015 work, DVF. 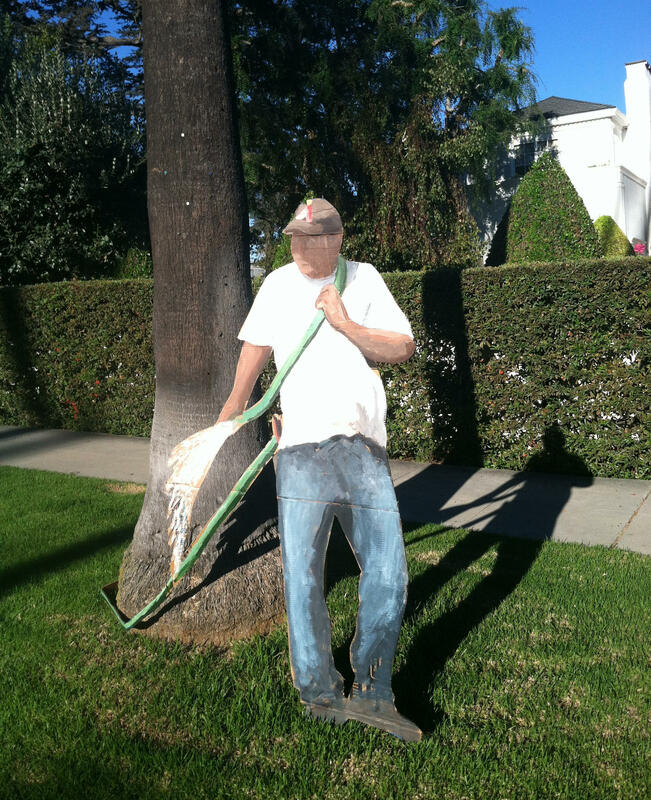 Gomez makes life-size cardboard cutouts of laborers — such as this "gardener" on North Beverly Drive — and leaves them on manicured lawns. A Cadillac gets washed in Gomez's 2014 The Next Generation Escalade. Gomez says people — including his mother — are starting to send him photos of workers in LA. Los Angeles is a city of extremes: There are neighborhoods so luxurious only millionaires can afford them and neighborhoods so poor that residents work several jobs to pay the rent. 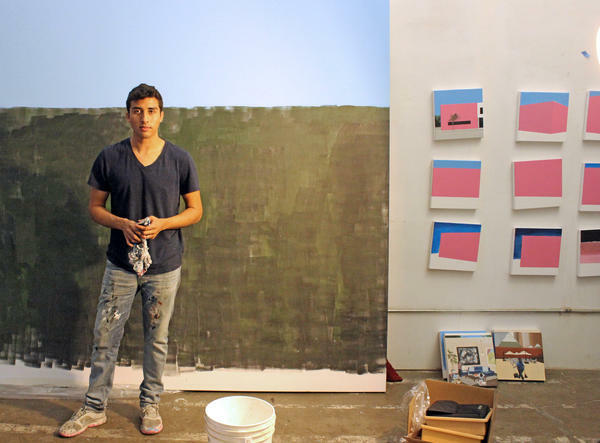 Now, a young LA painter is bringing these neighborhoods together on his canvases. Ramiro Gomez paints modernist houses in Beverly Hills, perfectly appointed kitchens and exclusive shops on Melrose Avenue. His pictures have nothing, and everything, to do with his background. Gomez's mother is a janitor, and his father works the graveyard shift driving a truck. Workers like his Mexican immigrant parents show up in his paintings — part of the invisible landscape of luxury LA. "Someone will always be working to keep it nice," Gomez says. "Whether it's a home in the Hollywood Hills or Beverly Hills or the Paramount Studios." Gomez puts those "someones" on his canvases. He shows mostly Latino gardeners tending perfect lawns, maids cleaning tiles in gleaming bathrooms and nannies gathered in the park. These images show "the lush, easy lifestyle of L.A., which is entirely undergirded by armies of domestic workers," says New Yorker magazine writer Lawrence Weschler. He's done a long essay on Gomez for the new coffee table book Domestic Scenes. The artist always has laborers in his range of sight, Weschler says. "I can be walking along with him," Weschler says. "He'll just say 'Eight.' I'll say, 'Eight what?' He says, 'There's eight workers I can see in my line of vision. There's that guy over there, there's that guy, and that lady that's there ...' "
In Gomez's version, the water darkens to cobalt and instead of a splash there's a man cleaning the pool. He's trawling for debris in the water. And over toward the back, a woman — she's faceless, like all his figures — sweeps the patio near a wall of windows. Gomez calls it No Splash. "The painting itself was originally going to be called Thursday Afternoon," Gomez explains, "because those are the times that the pool cleaner and the housekeeper would come into the space." Gomez, who is 29, knows that from his years working as a nanny in LA; in the expensive house where he worked he watched other servants come and go. Gomez does riffs on several Hockney paintings. He substitutes leaf-blowing gardeners for wealthy Hockney art collectors. He puts another gardener raking a grassy lawn that Hockney had shown being watered. Weschler has written extensively about Hockney and thought he'd make an introduction. "Next thing you know, we're driving up to the Hollywood hills up to Mulholland Drive through Laurel Canyon to meet him," Gomez recalls. Weschler says Hockney was completely charmed and impressed by Gomez. "He was excited to see these paintings in a different way," Gomez says. "He loved my choice of figures, he loved how I included the figures, he loved the color choices." So, two generations after Hockney's take on sunshine-living in Los Angeles, a Mexican-American shows unseen laborers, under those same sunny skies. Sometimes Gomez makes life-size cardboard cutouts of his workers, and stands them up on actual manicured lawns. "Invariably the owner gets pissed off and removes the piece — or, more accurately — orders it removed by the help," Weschler says. Gomez hopes the domestic workers do remove the cutouts — and take them home to keep. In addition to the paintings and cutouts, he rips pages from glossy magazines and applies his theme. 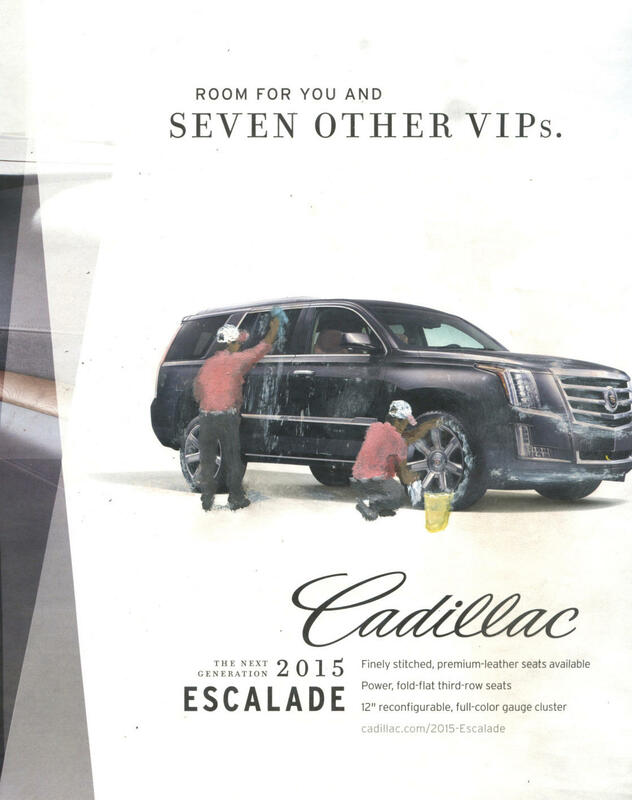 In an ad for a shiny black Cadillac SUV, he includes people washing the car. Gomez denies he's a political painter, but Weschler says Gomez is "wielding painting as a way of getting people to notice, and in some ways I think that's one of the most political things you can do." People are noticing and buying. In the past three years, California museums and private collectors have bought Gomez works, some for thousands of dollars. The grateful son of loving laborers was able to send his parents away for their first vacation. They spent a weekend at a nice hotel in Las Vegas. "Now they understand that this little 5-year-old that would draw on the wall, and a 15-year-old that would stay after school in art studios, and the 22-year-old that was painting in different materials, now to the 29-year-old that is being featured in NPR and artwork and gallery shows — it's all part of my journey," he says. Los Angeles has long been one of the most segregated cities in the country. The rich and famous live in mansions. The people who work there might live across town in a place that feels like a whole other world. A young LA painter is now bringing these neighborhoods together on his canvases. NPR special correspondent Susan Stamberg explains. SUSAN STAMBERG, BYLINE: The pool at a gleaming modernist house in Beverly Hills, a luxury store on exclusive Melrose Avenue, perfectly-trimmed hedges and a gorgeously appointed kitchen. Ramiro Gomez paints a Los Angeles that has nothing and everything to do with his background. RAMIRO GOMEZ: My mother is a janitor. STAMBERG: And your father, what does he do? GOMEZ: My father is a truck driver. And he drives every day - graveyard shift. STAMBERG: Workers like his Mexican immigrant parents show up in his paintings, part of the invisible landscape of luxury LA. GOMEZ: Someone will always be working to keep it nice, whether it's a home in the Hollywood Hills or Beverly Hills or the Paramount Studios. STAMBERG: Ramiro Gomez puts those someones on his canvases - the mostly Latino gardeners trimming hedges, the maids in the kitchen, the nannies in the park. He paints them tending the perfect lawns, cleaning tiles in the gleaming bathrooms. LAWRENCE WESCHLER: The lush, easy lifestyle of LA, which is entirely undergirded by armies of domestic workers. STAMBERG: New Yorker magazine writer Lawrence Weschler has done a long essay on Ramiro for the new coffee table book "Domestic Scenes." He says Ramiro's range of vision always includes laborers. WESCHLER: I can be walking along with him, and he'll just say, eight. And I'll say, eight what? He says, there's eight workers right now you can see in your line of vision. There's that guy over there. There's that guy. There's that lady that's there. STAMBERG: The first Ramiro Gomez painting to catch Lawrence Weschler's eye was a nearly precise reproduction of a work by David Hockney. The famous English artist began painting rich LA in the 1960s. Hockney shows turquoise water in a big swimming pool. WESCHLER: There's a diving board jutting out diagonally and a big splash of water in the middle. STAMBERG: The Hockney is called "A Bigger Splash." In Ramiro's version, the water darkens to cobalt. WESCHLER: And where the splash is, just over to the side, he has a pool cleaner. STAMBERG: Trolling for debris in the water - and over toward the back, a woman, faceless like all his figures, sweeping the patio near a window wall. Ramiro calls it "No Splash." GOMEZ: The painting itself was originally going to be called "Thursday Afternoon." GOMEZ: Because those are the times that the pool cleaner and the housekeeper would come into the space. STAMBERG: At age 29, Ramiro knows that from his years as a nanny in LA. He watched other servants come and go in the expensive house where he worked. Ramiro does riffs on several Hockney paintings. He substitutes leaf-blowing gardeners for wealthy Hockney art collectors, puts another gardener raking a grassy lawn that Hockney had shown being watered. Lawrence Weschler has written extensively about David Hockney. He thought he'd make an introduction. GOMEZ: And next thing you know, we're driving up to the Hollywood Hills, up to Mulholland Drive, through Laurel Canyon, to meet him. STAMBERG: Weschler says Hockney was completely charmed by Ramiro. Inspecting the works on an iPad, Hockney was impressed. GOMEZ: He was excited to see these paintings in a different way. He loved my choice in figures. He loved how I included the figures. He loved the color choices. STAMBERG: So two generations after Hockney's take on sunshine living in LA, a Mexican-American shows us the unseen under those same sunny skies. Sometimes Ramiro makes life-sized cardboard cutouts of his laborers and stands them up on actual manicured lawns. WESCHLER: Invariably, the owner gets pissed off and removes the piece or, more accurately, orders it removed by the help. STAMBERG: Ramiro hopes the domestic workers do remove the cutouts and take them home to keep. In addition to the paintings and cutouts, he rips pages from glossy magazines and applies his theme - an ad for a shiny black Cadillac SUV. GOMEZ: I decided to include the car cleaners, the people that are washing that car. STAMBERG: Do you consider yourself a political painter? GOMEZ: I consider myself a painter. STAMBERG: Is he a political painter? WESCHLER: He is a very, very strong painter in his own terms. But he is also and without doubt wielding painting as a way of getting people to notice. And in some ways, I think that's one of the most political things you can to. STAMBERG: People are noticing and buying. In the past three years, California museums and private collectors have bought Gomez' works, some for thousands of dollars. Ramiro Gomez, the loving grateful son of loving laborers, was able to send his parents away for a weekend to Las Vegas. A nice hotel, he says - their first vacation. GOMEZ: Now they understand that this little 5-year-old that would draw on a wall and a 15-year-old that would stay after school in the art studios and the 22-year-old that was painting in different materials, now to the 29-year-old that is being featured in NPR and artwork and gallery shows, it's all part of my journey. STAMBERG: Meanwhile, something interesting is happening. People are sending photographs of workers to Ramiro Gomez. His mother is taking photos of other janitors and laborers in schools. So in addition to his paintings, his people are being seen. I'm Susan Stamberg, NPR News. MONTAGNE: And you can see some of those people too, at npr.org. Transcript provided by NPR, Copyright NPR.